The bus then crashed through the guardrail and plunged into the Chongqing section of the Yangtze River. The driver of the private car, surnamed Kuang, is being treated in hospital for undisclosed injuries. The Chinese Ministry of Emergency Management has deployed 12 rescue divers and a 40-ton floating salvage vessel to the site of the accident. 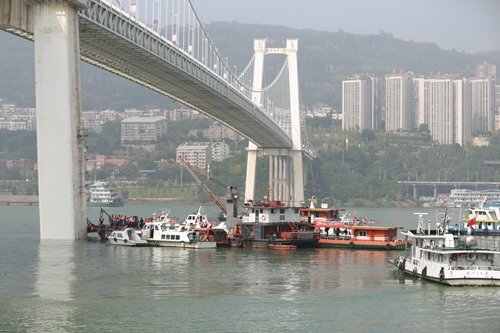 Fifty Chongqing firefighters, five firefighting trucks and two boats are involved in the rescue mission, the People's Daily reported.